An extra height bar-style systems specifically designed for bottle filling. Instant chilled and sparkling filtered water. Designed for high volume bottle or flask filling of still or sparkling water for meeting room, hospitality and leisure. The Billi Spring 350 Bottling System and The Billi Spring 550+ Bottling System provide you with a solution for dispensing high volumes of chilled or sparkling filtered water. Robustly built, they are very simple to operate and maintain. Using a single compact under counter unit, the Billi Spring 350 Bottling System has the capacity to produce 60 litres chilled water per hour and the Billi Spring 500+ Bottling System has the capacity to produce 80 litres chilled water per hour . This makes this type of a water system an ideal option for corporate hospitality or meeting room refreshments. 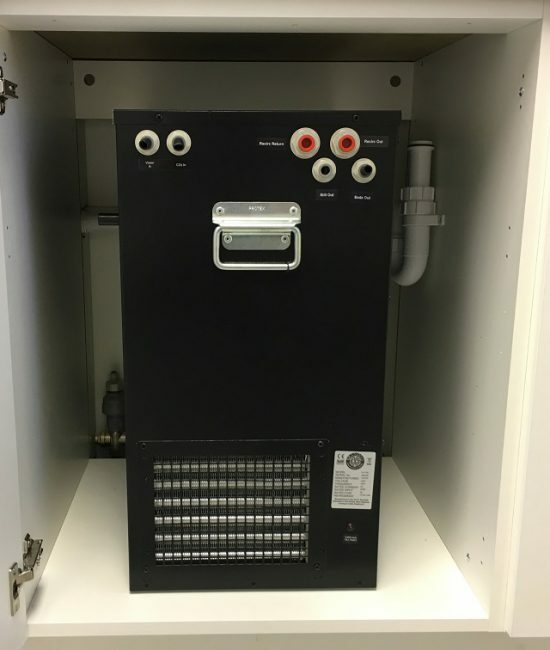 Very economical to use, where even the sparkling is only 400w, both systems will dispense into a narrow neck container up to 310mm high via its bar-style tap. It is normally supplied with a drainage font. Billi premium filters ensure that health threatening pollutants and impurities such as sediment, chemicals, heavy metals and pesticides are removed leaving you with refreshingly clean drinking water, every time. Replacement filters can be purchased direct from one of our approved merchants or direct Billi by calling 020 7456 6789. As with all the other Billi drinking water appliances, the Boiling and Chilled range is covered by a comprehensive 24 month parts and labour warranty. As the manufacturer we not only have full control over quality standards, but we are also uniquely positioned to offer exceptional client care and after sales backup. Why choose the Billi Spring 350 or 500+ Bottling System? It dispenses more, it dispenses higher and with the same exceptional filtered water quality. Fixed electronic controlled to optimum temperature. The Billi Spring 350 Bottling System is a plumbed-in water chiller which is aesthetically striking, and very compact for space efficiency. Built for durability and reliability, the Billi Spring 500+ Bottling System achieves optimum dispense-point temperatures by combining its efficient refrigeration system with a unique and optimised coil-pack design. Will fill even narrow neck bottles up to 310mm high. Fast and efficient. Two valves on the tap head provide chilled and sparkling filtered water. The Billi Spring 350 Bottling System provides up to 60 litres of chilled or sparkling water dispensed per hour, the Billi Spring 500+ Bottling System up to 80. Ideal for board rooms, meeting rooms, receptions and other areas of high sparkling requirement. 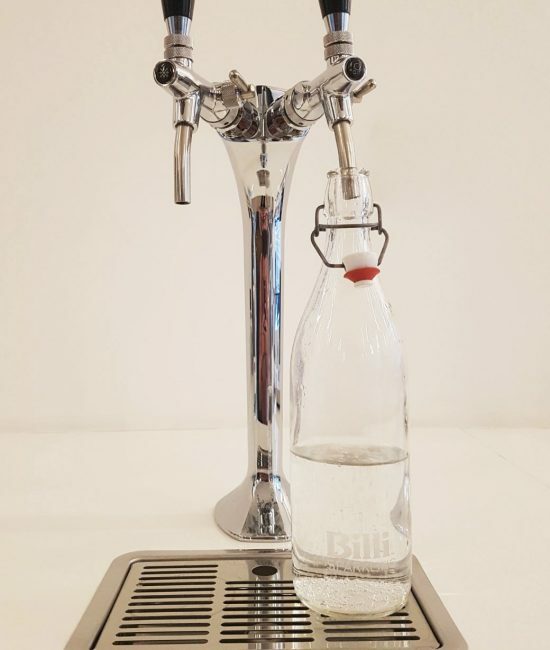 Can the Billi Spring Bottling System tap dispense into 1 litre bottles? Yes. Although the standard clearance is 310mm, the dispenser tube is small enough to insert down narrow bottle necks so practically even most 1.2 litres bottles can be used. How long does a CO2 cylinder last, and where do I buy one? This will depend on the level of carbonation you set. The system is adjustable for taste which gives the equivalent of 250-350 glasses of water per 1.1kg cylinder. These disposable cylinders can be purchased online: www.billi-uk.com/online. Does the under counter unit need venting? Like other high-volume systems on the market, the Billi Spring Bottling Systems unit are fan-cooled and will require cupboard ventilation. Have a question or need product help & support?